MAY 24, 2018—Xavi Cortadellas walked across the stage, sharing the story of Gatorade’s beginning fifty years ago. A group of scientists, led by Dr. Robert Cade, created a sports drink to help the Florida Gator football players stay hydrated in the Florida humidity. That was the beginning for Gatorade’s Gx Platform, an innovative product led by Cortadellas. 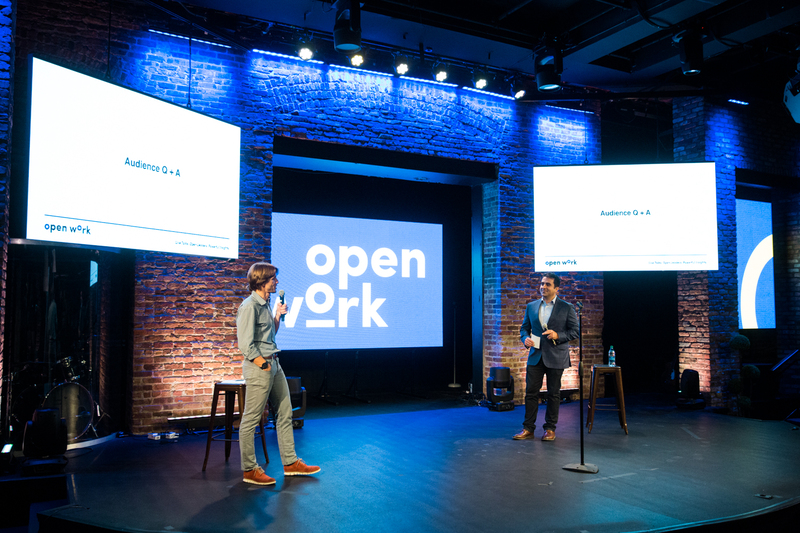 More than eighty people gathered for Guerrero Media’s inaugural OpenWork to learn how to infuse innovation in their day-to-day work from Cortadellas. OpenWork is a new way to bring Guerrero’s mission of recognizing, promoting, and developing great executives to life. “The goal of OpenWork is to provide the executives we work with an opportunity for them to share their insights with a live audience and with our employees at Guerrero,” CEO Pedro Guerrero shared with the audience. Cortadellas took the stage to share his innovation insights, which he developed throughout his career and brought to life in leading his team in the creation of Gatorade Gx. The innovation leader had studied architecture, and these skills have helped his leadership. He presented five principles for infusing day-to-day innovation into any workplace. Third, pilot the product and services in different contexts to prioritize features. Many consumer packaged goods (CPG) companies like to do tests, but “the problem with tests is that you pass or you don’t pass,” Cortadellas said. “On a pilot, you build experiments and you learn from experiments.” You learn from the experiments, and perfect your vision with each. The fourth principle is to celebrate the wins to build confidence among your team. Cortadellas told the audience about when his team was working with the Brazil national team during the World Cup. They invited colleagues from the R&D team to come to Brazil and witness the pros using the products R&D had developed. “For the guy who spends all his life in the lab developing formulas to see Neymar using a product he designed, he will go back to the lab and he will work really hard to move to the next level,” Cortadellas said. For more photos from the event, visit the Guerrero Media Facebook page.